β Lyrae, known as Sheliak to the ancient Arabs and Tsan Tae to the ancient Chinese, was discovered to be a variable star by John Goodricke in 1784, about two years after his successful explanation of the light variations of Algol. In the more than two centuries since its discovery, β Lyrae has played a game of cat and mouse with astronomers attempting to unlock its secrets. Only slowly have some of those secrets been revealed. We know that β Lyrae is an eclipsing binary system with an orbital period of about 12.9 days and the period is increasing at a rate of about 19 sec/year. The O-C diagram (Kreiner, Kim and Nha, 2005) of eclipse timings seen in Figure 1 shows a beautifully parabolic shape, indicating a constant rate of period change. Figure 1. O-C diagram for β Lyrae eclipse timings from Kreiner, Kim and Nha (2005). Click image to enlarge. β Lyrae's light curve in the visible part of the spectrum serves as the prototype of the EB light curve classification: rounded maxima and broad minima with different depths. Figure 2 shows the V light curve of the system with data from 1987 to 1994 published by Van Hamme, Wilson and Guinan (1995). Note the rather large scatter in the light curve which, at first, is rather surprising given that the system is rather bright. It turns out that the large scatter is a result of intrinsic variability and not observational error. The large rate of period change and the intrinsic variability are clues that β Lyrae is a very active system. Figure 2. V band light curve of β Lyrae from Van Hamme, Wilson and Guinan (2005). Click image to enlarge. Observations of β Lyrae in the ultraviolet show a very different behavior: almost no variation in brightness over the orbital period at wavelengths shorter than about 1200 Å. Stated another way, when viewed in the ultraviolet β Lyrae doesn't look like an eclipsing binary at all. Figure 3 shows the light curve of β Lyrae in the ultraviolet at wavelengths of 955 Å and 1475 Å as measured with the Voyager Ultraviolet Spectrometers (Kondo, et al., 1994). At 1475 Å the light curve exhibits a form similar to that of the optical light curve but at 955 Å, the light curve is remarkably flat. That rather strange dependence of the light curve on wavelength is another clue that β Lyrae is not your average eclipsing binary. Figure 3. The light curve of β Lyrae at 955 Å and 1475 Å from Kondo, et al. (1994). Note the lack of eclipses at 955 Å. Click image to enlarge. β Lyrae has long been known to show emission lines in its complicated spectrum (Struve, 1958), yet another indication of activity in the system. Although the spectrum of β Lyrae is quite complicated, consisting of at least six distinct sources (Bisikalo, et al. 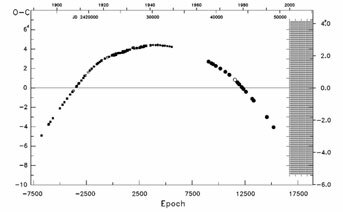 1999), one easily recognized source does stand out: the absorption lines of a star with a spectral type of B6II to B8II. This star is the one eclipsed at primary minimum in the optical light curves and I will refer to it as the primary star. The primary is, therefore, a giant with an effective temperature of about 12,000 K. The nature of the primary star is the subject of little dispute. The nature of the secondary object is, on the other hand, still the subject of some debate. Astronomers had struggled without success for decades to explain the secondary component as a star of approximately spectral type F. In 1963, however, came the critical piece of the puzzle. Huang (1963) proposed that the primary was, in fact, less massive than the secondary which was embedded in a geometrically and optically thick disk. This interpretation was truly a turning point in our understanding of β Lyrae because it explained the shape of the light curve and the absence of the spectral lines of the secondary in the spectrum in a simple and intuitive way. Wilson (1974) explored the disk model in a quantitative fashion and showed that it must be geometrically and optically thick. Later he produced detailed models of the structure of the disk (Wilson, 1981; 1982). The Huang model has survived the test of time. After over forty years, the core ideas of the model form the basis of the modern interpretation of the system. Although there are disagreements about the detailed nature of the disk (see Wilson and Terrell, 1992 and Hubeny, Harmanec and Shore, 1994), almost everyone agrees with the idea that the secondary is a stellar object embedded in a thick disk. So, the obvious question is "How did β Lyrae end up in its current state?" In the past, β Lyrae had been considered a unique object and understanding the evolutionary history of a unique object can be difficult. About 25 years ago, Plavec (1980) showed that β Lyrae was a rare but certainly not unique object. Using the International Ultraviolet Explorer (IUE) satellite, he showed that there were a handful of systems that had similarities to β Lyrae. Now we could begin to see patterns. These systems, which he termed the W Serpentis stars, all showed strong emission lines in the IUE spectra, indicative of large-scale mass transfer between the two stars. The current view of β Lyrae is that it is nearing the end of the rapid phase of mass transfer (RPMT) that results when the more massive star in a binary reaches its Roche lobe and transfers mass to the lower mass star. Readers familiar with the resolution of the "Algol Paradox" will recognize this explanation. When the more massive star reaches its Roche lobe and begins to transfer matter to the other star, the Roche lobe shrinks because the star is losing mass and the separation between the stars decreases. This, of course, leads to more mass loss and a still smaller Roche lobe. We have a classic runaway feedback situation and the mass loss proceeds on a very rapid timescale, over thousands of years, as opposed to the much longer nuclear timescales of billions of years on which stars usually evolve. Now consider what happens to the initially lower mass star (let's call it the gainer) as all of this mass comes pouring towards it. If the gainer's radius is small compared to the separation of the two stars, the matter stream will not impact it directly but form a disk around the gainer. Viscosity will cause the disk to spread out and some of the material will accrete onto the gainer while smaller amounts are lost to the system via jets perpendicular to the disk (Harmanec, et al 1996) . If the gainer's radius is large compared to the separation, the matter stream will impact the surface of the gainer and spin it up, like water sprayed onto a pinwheel. Stars adjust structurally on timescales larger than the rate at which mass is being transferred in this RPMT stage, so the material tends to build up and form a thick accretion disk that engulfs the gainer. 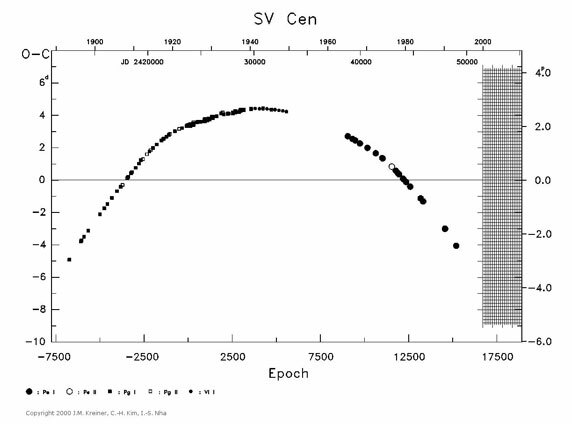 SV Centauri is believed to be a system in this rapid, and hence rare, stage (Wilson and Starr, 1976) and Figure 4 shows that it has a decreasing period as expected. Figure 4. O-C diagram of eclipse timings for SV Cen from Kreiner, Kim and Nha (2005). Click image to enlarge. Note that the parabola is reversed from the one for β Lyrae, indicating that the period is decreasing. Eventually enough mass is transferred that the once lower mass star is now the higher mass star and the mass transfer slows considerably. Since mass is now being transferred from the lower mass star, the period increases. β Lyrae is believed to be at this stage. As the mass transfer slows, the accretion disk continues to settle onto the gainer. Eventually the disk will disappear (primarily via accretion) and the gainer will reappear as a relatively normal but now much more massive star. It will also be rapidly rotating, perhaps at the centrifugal limit, making it a double contact binary as defined by Wilson (1979). RZ Scuti and U Cephei are probably examples of such systems, frequently referred to as the Rapidly Rotating Algols. Eventually, tidal forces will synchronize the rotation of the gainer with the orbit and the system will be a classical Algol, like Algol itself. Once the system reaches the Algol stage, its evolution proceeds at the more leisurely nuclear timescale. Thus β Lyrae, once seen as a unique "freak" among binary stars, is now thought to be an example of one stage in the evolution of certain close binaries. Many details of this evolution remain to be determined and new computer codes capable of modeling stars in three dimensions on massive computing clusters with hundreds or thousands of CPUs are being developed to more fully test our current ideas. Most importantly, β Lyrae continues to be observed. As the late Brad Wood once told me, "The more a system has been observed, the more it should be observed." The AAVSO is contributing valuable data on β Lyrae, especially the infrared photometry team led by Doug West. Using the Optec SSP-4, we are observing β Lyrae in the J and H photometric bands, providing valuable data at wavelengths rarely used in studying the system. But all observations of β Lyrae are valuable, be they infrared photometry, optical photometry or times of minimum. They will enable astrophysicists a century hence to uncover more secrets about this enigmatic binary that sits high in the northern summer sky and slowly reveals its secrets to those who invest the effort in prying them loose. Wilson, R.E. 1982, "Structural Models for Beta Lyrae Type Disks", in "Binary and Multiple Stars as Tracers of Stellar Evolution", pp. 261-273. This Summer's Variable Star Of The Season was prepared by Dr. Dirk Terrell.